It rehearses with NYAC for the real thing in June. 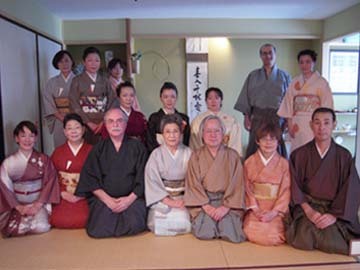 The Memorial Day observances (Rikyuki) held each year to honor Sen no Rikyu, the great pioneer of Chanoyu, took place on March 28 at the Omotesenke Schoolﾕs Sohga-an (Koike Sohga Hostess) in Manhattan. Sen no Rikyu who gave shape to the wabi style of Tea passed away at the age of 70 on the 28 day of the second month in the old calendar. Since that time, that date, celebrated on March 28 in the New Calendar, has become an important event at which all the Sen families that have inherited his spirit recall what he has left us. At this yearﾕs Rikyuki, 15 people including students of the Koike Circle and observers from a Long Island Japanese Saturday School took part. Beginning at 11:00 AM, the group gathered in the tea room where Rikyuﾕs death poem was displayed on a scroll in the alcove, " I raise the sword, This sword of mine, Long in my possession The time is come at last. Skyward I throw it up!" (D.Suzuki trans. 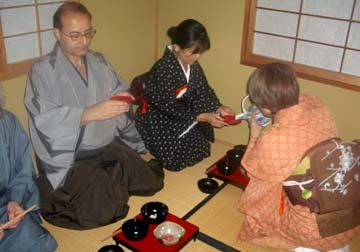 ), an offering of tea was made in a Tenmoku tea cup and the group enjoyed thin tea in memory of Rikyu. Thereafter, the tea gathering continued over a home-made meal. 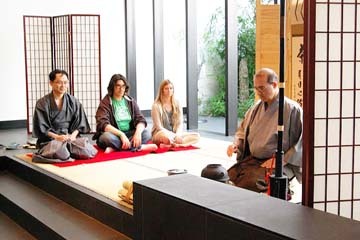 At the Sohga-an in New York City, 16 participants gathered for the Hatsugama (literally, the "first kettle") of the New Year. Sohga Koike hosted the Omotesenke-style celebration which began at 11:00 am. 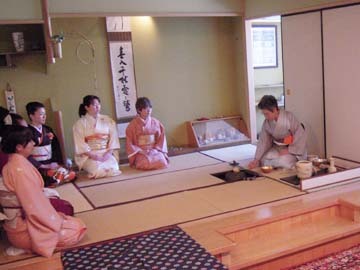 The Hatsugama is the first practice of the New Year, and the guests took the opportunity to exchange stories about the happenings of the New Yearﾕs holidays with friends they had not seen in some time. In an alcove in the facing wall of the tea room, a scroll and the traditional arrangement of slender willow branches elegantly coiled in a circle together with a single Winter Camellia were on display. The scroll, inscribed by Murasakino Shodo, the head monk of the Zuiho-in in the Daitokuji, read, "All through the forest, spring has arrived and the warblers are singing." All together, the arrangements suggested the expectations and resolutions of the New Year. After enjoying thin tea to begin with, the hostess prepared thick tea using Tanzan Morimotoﾕs tea caddy named, "Sazareishi," a tea scoop in the style favored by Sen no Rikyu named "Chiyo no Kotobuki," and matched utensils with a design of Nonomura Ninsei. Next, everyone enjoyed a home-style lunch and finished the day with a drawing of gifts that the hostess had prepared for everyone. Outside a cold wind was blowing, but within, the group enjoyed the hostessﾕ warm hospitality and a taste of spring. 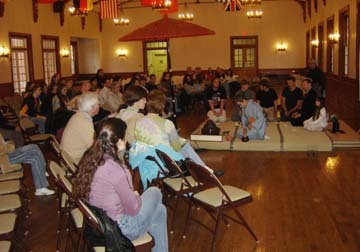 With the inauguration of the Easter Region Branch planned for June of 2010 and many preparations facing the group, all agreed that the name of the Tea Caddy, "Sazareishi," a boulder formed by the joining of many smaller pebbles, was an appropriate theme for the day and that the group needed to nurture that spirit during the year. 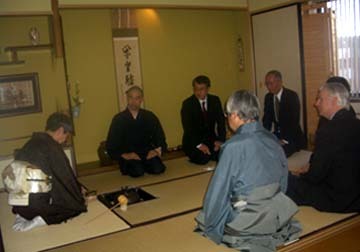 Masako Koike, head of the Sohga-an, invited The Reverend Kenjitsu Nakagaki of the New York Buddhist Church, Mr. Jiro Okuyama, Director of Japan Information Center at Consulate General of Japan in New York, Mr. Yuichi Ozawa, Chairman of Shofuso in Philadelphia and other guests to Noon Tea Gathering at the Sohga-san. 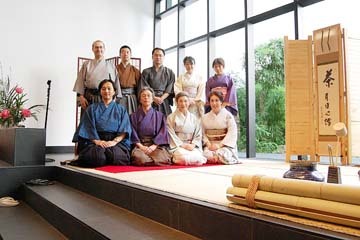 It was the first time any of these guests had participated in a Tea Ceremony. 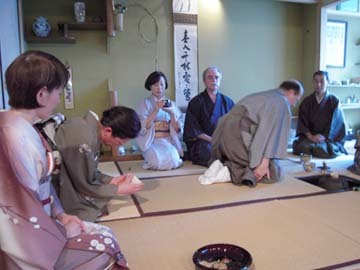 But with adjustments to the normal order so the guests could practice with thin tea first, then enjoy thick tea, they all seemed to enjoy Chanoyu. By the time lunch had arrived from the Nippon Club, all were deep in conversation about the riches of Japanﾕs traditional culture. At the Princeton Classroom, we held a Noon Tea Gathering. Noon Tea is the basis for all other Tea gatherings, so that when one has mastered Noon Tea, it becomes easier to understand Morning Tea, Moon Viewing Tea and so on. Admiring the last of the fall foliage, we spent 4 hours in study and enjoyment. It made everyone realize again our day-to-day practice throughout the year was in preparation for events such as this. 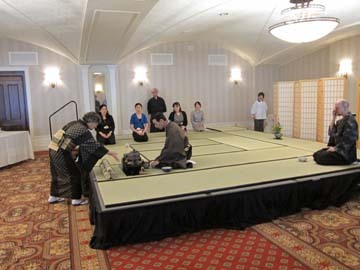 At the Hammond Museum and Japanese Stroll Garden in Westchester County, we presented a demonstration Chanoyu to an audience of American guests. A total of 30 people joined us in morning and afternoon sessions. 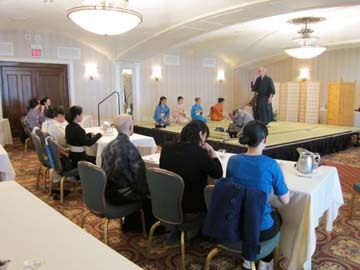 At Kids International Weekend School in New Jersey, the 6th graders gathered to observe a demonstration of Chanoyu. 10 6th Graders sat on the tatami while Mr. Nakamura, the Principal, teachers, parents and younger students observed from chairs. The children who are normally in constant motion sat quietly for the Ceremony and seemed impressed by the richness of Japanese traditional culture. As one of the program events in a symposium on US-Japan relations held at Mary Washington University, Fredericksburg, VA, Sohga Koike demonstrated for the symposium participants and University students how thin tea is prepared. It was the first demonstration in a part of the country that has little exposure to Japanese culture, but the observers followed the demonstration intently and judged that it was the most easily understood introduction to Japanese culture in the whole symposium. 347 West 57th Street Suite 15C, New York, NY 10019-3167. U.S.A. Copyright � 2007 Sohga-An New York. All Rights Reserved.